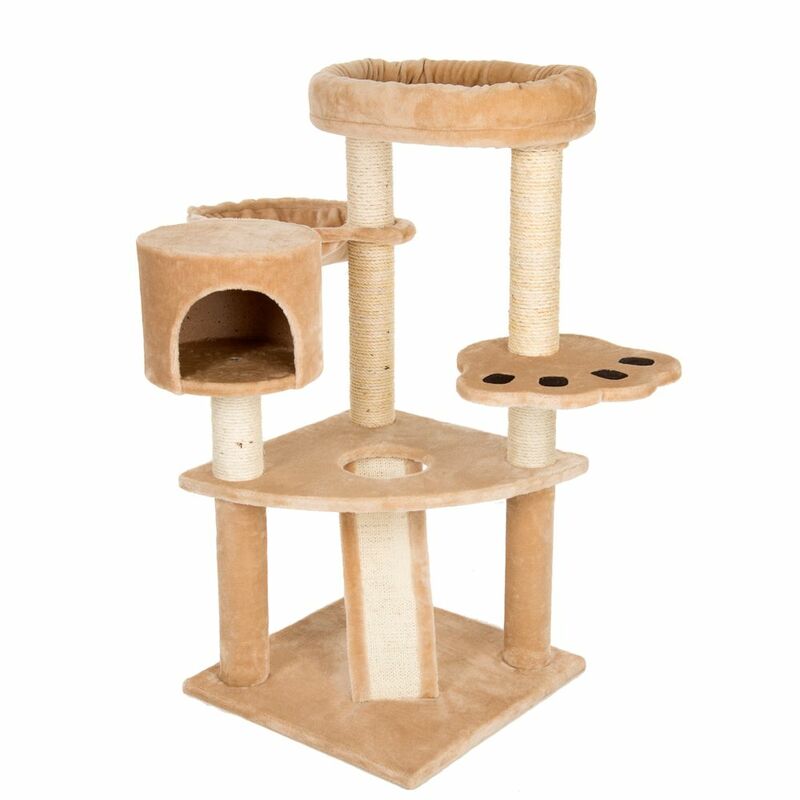 The Bear's Den cat tree is a compact cat tree that fits in any home. It offers your cat lots of different ways to keep its claws neat and tidy, with a wide sisal scratch mat as well as several sisal posts. Kittens and older cats can easily climb up to higher levels using the scratch mat. There are several sleeping areas on different levels. There is an attractive pawprint-shaped sleeping area as well as a comfortable den to hide away in. The large, round hammock and the den are both ideal for hours of dreaming and dozing. There is also an oval snuggle bed with a border on the uppermost level, which is sized to suit larger cats as well as multiple cats at once. The snuggle bed has an elasticated cover that can be removed from the base for machine washing. Bear's Den cat tree at a glance: Compact cat tree with multiple sleeping areas and scratching surfaces Ideal for multi cat households or cat families with kittens or older cats Includes a wide sisal scratch mat: to help cats to climb the cat tree as well as providing an extra scratching surface Oval snuggle bed with border:sized to suit larger cats or multiple cats at once Removable, ,machine washable snuggle bed: for easy and hygienic cleaning Cosy den with a sleeping platform on its roof, plus a hammock are additional areas for your cat to sleep and relax Stable Easy to climb Colour: beige Total dimensions (L x W x H): 55 x 55 x 116 cm Base plate (L x W): 55 x 55 cm Sisal scratch mat (L x W): ca. L 48 x B 17 cm 1st platform, rounded (L x W): 55 x 55 cm Entrance diameter: 17cm 2nd platform – pawprint shaped (L x W): 41 x 37 cm Den: Total dimensions: diameter 31 x 25 cm Entrance (W x H): 20 x 18 cm Hammock with metal frame: Total dimensions: diameter 40cm Sleeping area: diameter 35 cm Snuggle bed with border: Total dimensions (L x W x H): 57 x 40 x 10 cm Sleeping area (L x W): 50 x 30 cm Elasticated cover of snuggle bed can be removed for washing Machine washable at 30 degrees;C 3 plush posts: diameter 9 cm x 40cm 6 sisal posts: diameter 9cm 2 x 40cm 1 x 21cm 2 x 20cm.